I'm a big fan of Amazon's Kindle , but it can always be improved. Here's another idea to add to my growing list. "Share this" buttons exist on almost every content page, I can share with Twitter, Facebook, Linkedin, to name a few. Most news and magazine sites have a format for printing button as well. What about send to Kindle button? This seems so simple, but makes taking long format text content and moving it to where you want to read it EASY. Similar to Fred Wilson's Watch Later post on online video. Like video there are plenty of articles that you want to consume later. There is nothing more enjoyable than to take a long article I've found online and converting it over for reading on my commute. This takes multiple steps right now just to make this happen. How about a one click solution Mr. Bezos? This could be a way for publishers to generate a little extra revenue for minimal work. Amazon could allow the publisher to set a premium price for sending an article, if you're not a paid subscriber, and provide some revenue with every press of the button. This could also be a nice way to market subsidized Kindle subscriptions with the magazine or newspaper. If I'm a paid subscriber, then this just makes the subscription stickier. Don't charge me a premium, just make it "one click easy." I finally broke down and had a few of my steel casement windows sent out to be restored. I've blogged before that I'd like to restore them myself, but with the winter here and a new job I figured I'd try out the professionals. There was serious rusting on the bottom of the window frames that mount in the building, so before I sent them out I sanded and treated with Rust-oleum heavy rust primer. The company I'm working with is Metal Man Restoration in Mount Vernon, NY. They came and picked up and removed the windows- something I suggest having a professional do since they are heavy and we're on a high floor. If they fell they could do some serious damage to the building as well as to someone walking by. Metal Man's process is to put the windows into a paint removing bath to strip them down to bare steel. Next step is to remove the glass panes and old glazing. From there they spray the window frames down with a metal paint, replace the glass, and put in linseed-oil-based black window glaze. This is allowed to dry and then they are remounted. 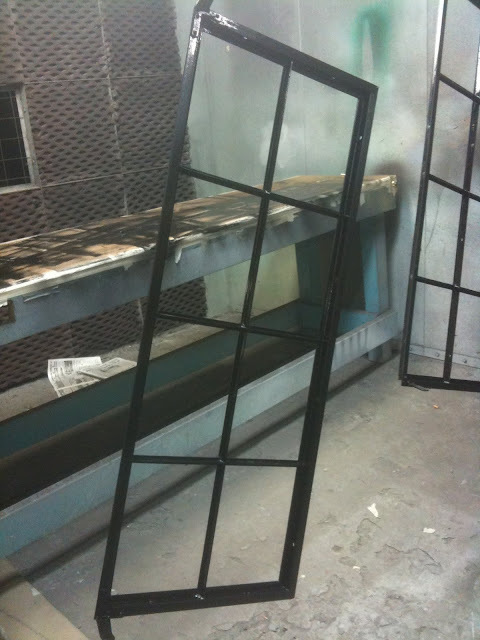 Below is a picture of the windows while they are drying after their paint job. More to come when they are re-installed. Finally went back and added tags to some of my older posts. Sorry if they show back up via RSS. I just read a great article about Gary Gensler, chairman of the CFTC (Commodity Futures Trading Commission) in Businessweek. Gensler is an ex-Goldman Sachs partner and he's striving to make signficiant changes as to how derivatives are regulated. Tough changes. Over a private lunch at the Waldorf Astoria on Jan. 6, Gensler, 52, told executives from Credit Suisse (CS), Deutsche Bank (DB), Bank of New York Mellon (BK), and Goldman that while he once shared their goals—to boost revenues and their own bonuses—his responsibility now was to taxpayers, according to people familiar with the meeting. When one banker asked Gensler what he saw as the biggest obstacle to reform, he gestured toward his hosts and replied: "You." Why should the general public care about these complex financial products? Because they helped to make the financial melt down worse. These are products that trade in the shadows, that lack a real transparent marketplace, which means there are big profits and big risks being taken. Of course in proper Congressional fashion the legislation has loopholes in it that will allow the shenangans to continue. Gensler knows how the game is played and is calling people out on what's reality and what's false. During agency discussions about rules on how firms trade and account for their transactions, "We've had times when someone says, 'The banks tell us they can't do that,' " Chilton recounts. "And Gary says, 'That's crazy. I used to do it all the time.' "
This blog post might make it sound like I'm anti-wealth, anti-profits. I am for wealth and profits, just not at the expense of the entire country. It's fine to make a profit with you business, if you don't you go out of business. You go out of business maybe you wipe out your investors, you default on your loans, etc. The difference with what we experienced on Wall Street was that they made profits, but when they went out of business they almost put the country out of business. To put it another way, if you speed and drive recklessly on the highway you put yourself and drivers around you at risk. Most people who see that reckless driver coming will get out of the way, or they will avoid that road if it's filled with reckless drivers. The entire country of drivers never saw that driver coming and weren't able to avoid that road. The driver wrecks and takes out all the drivers on the road. Now your insurance preimiums just went up because it's a really bad wreck and that reckless driver didn't have insurance. One of the great things about keeping bees is that it's relatively easy to test out new "things." Things being new equipment, new strains of bees, new bee keeping techniques. Measuring the results might be difficult, but it's fun either way. As it's almost time to get ready for the spring I figured it was a great time to sit down and come up with 2010 beekeeping list of key things to do. 1. Focus on hive yield vs hive growth: This year I've decided to keep my hive count essentially flat and focus on my honey yield. The last two years were embarrassingly low. Maybe it wasn't too bad last year as many of the experienced beekeepers in the LI club also had a terrible harvest. I'm at six hives right now, maybe I'll grow to 8, or maybe not. I'll need to make sure they have plenty of comb and are well-feed in the spring and monitor for small hive beetles (SHB) and the Varroa mite. 2. New hive configuration: I'm going to try setting up a hive with just medium supers, instead of two deeps. There are pros and cons, but many people rave about medium setups because they are easier to move around. A fully loaded deep hive body can weigh 90 lbs, while a medium is 60 lbs. It might not seem like a lot of weight but fill them with angry bees and place them at the most inopportune height for picking up and you'll feel my pain. Using three mediums instead of two deeps will give me the same storage capacity. Talking with Pete (master beekeeper) he loves that setup and finds them to have many advantages. I'll start this hive with a package of bees from Pete. 3. Try out ordering a NUC: I'm also ordering a Nuc to start a new hive or if I have a dead hive to restart it. A Nuc essentially gives you a 45 day head start on a package, but they get delivered later than a package of bees so you pick up a 21 day head start. We have an early nectar flow on Long Island thus it might work out better. A NUC comes with 4 frames of bees which only fit in a deep hive body. 4. Test out some Russian bees: Pete is making his Cannonball run to Georgia to pick up a van full of package bees. From Pete I'll pick up a four pound package of Italian bees with a Russian queen as well as, fingers crossed, two Russian queens to re-queen two of my hives. The two extra Russian queens will allow me to change over their ethnicity from Italian to Russian. He's also going to be setting up a bunch of his own hives which I'll help out with too. Diana will be on hand to shoot plenty of video for your viewing enjoyment. A great way to get even more practice while setting up ~ 30 hives ~ 120 lbs of bees. 6. Feeding: I'm going to feed my bees early for a spring build up. I'm also going to plant plenty of clover and other bee food nearby to help provide a close forage. I had the pleasure of attending the AdMeld Partner Forum today at the Time Warner Center. It was an Advertising.com reunion with current and past employee galore. Alums have scattered to the wind and they represented probably a dozen companies. Twitter was hot with some great nuggets from the panels. Kicking it off with the keynote was none other than Emily Riley from Forrester Research. Emily is old school Advertising.com, one of the first delivery managers in the company. She helped pioneer the online education business back in the day with Casey Cook and Mike Peralta. Emily is super sharp and delivered the goods about RTB as well as shared some interesting marketer feedback about their expectations of display performance. If you weren't there you can download a copy of the research here. 1. It's small, but growing fast. When people mentioned the number of bids being handled in a day or a month we're still not talking about large numbers. People realize scale is important and this was echoed across many panels. It's not efficient to sell six impressions to anyone right now. 2. You don't necessarily need RTB to get what you need. Much of the performance the demand side platforms (DSPs) are driving aren't really related to naming your price in real-time. It's the ability to cherry pick the right impressions based on a data set you choose and you know correlates with performance for you. 3. Someone on the agency panel said something to the effect, "CMO's eye's glaze over at the discussion of the technology involved with all of this." This was in response to whether companies would build and/or run their own DSPs. Since many companies change their agencies every few years, doing it all themselves would require them to change out their marketing team. Not sure a wholesale liquidation of the team will be the most efficient. Operators will be needed to run the DSPs for most advertisers. 4. RTB won't takeover all of the direct sale business anytime soon - it would be too unpredictable for the buyers and sellers. The advertisers need to spend their marketing budgets and show results. A large portion of this needs to be locked in to ensure the results. Leaving it up to the minute by minute moves of auction is not reassuring. You might not spend your budget and reach your audience. The sellers of media have goals and executives that need to forecast revenue. Minute by minute forecasting doesn't really work. This will encourage sellers to sell upfront deals to lock in demand and commissions. 5. Attribution is still up in the air and just because we can measure better online with clicks and purchases doesn't mean we aren't delivering branding benefits. It's just easier to overshadow with such measurable results around the bottom of the sales funnel. If we can't predict every result perfectly there is still need to buy and pray you choose wisely. 6. Publishers are getting smarter about how they sell their inventory. Designing the right channel conflict and understanding what each channel should offer as a feature set to advertisers should start to help bring some order. Wrapping it up, special thanks to the AdMeld team for putting a great event together.